The work in Jerusalem concentrates on collaborative mapmaking techniques for creating independent documentation of the urban environment. It is developing through various partnerships between activists, architects, planners community organizers and different groups of inhabitants that are interested in DIY mapmaking for their causes and needs. Here is a great article that can provide an overview: https://micromag.evidenceandinfluence.org/article/mapmaking-in-jerusalem/. Below is a list of projects initiated in Jerusalem, organized by date, indicating name of area or neighborhood and a short description. July 2011. Aerial map created during a demo in solidarity with the declaration of a Palestinian state in the UN, July 2011. see also: http://publiclab.org/notes/warren/7-21-2011/balloon-mapping-protest-jerusalem From some unknown reason, the map was disassembled on mapknitter but later restitched and published by Stewart Long. July 2012. 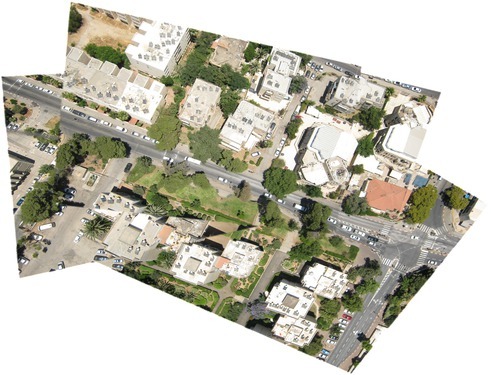 The aerial map of Jaffa street and the old city's corner was taken as part of an open workshop in Yaffo 23 art gallery, in collaboration with mamuta.org. The workshop, conducted by Zemer Sat and Hagit Keysar, was part of the exhibition Experiments in Techniques of Awakening 15/7/2012-4/8/2012. Here is the stitched map we created: This aerial image is annotated if viewed on flickr. June 5 2012 A balloon mapping, not yet stitched to a full map of the area photographed, in Bak'a neighborhood, as part of a an improvised street-exhibition of artists working in the Mamuta art and media center in Ein Karem, which were protesting against the closure of the center due to insufficient funding. May-June 2013 DIY aerial photography workshop took place May 8 2013 in Beit Safafa, a southern Jerusalem Palestinian neighborhood/village. We met in the protest tent which was created for a joint resistance against the construction of road 4 that goes through Beit Safafa, an Arab neighbourhood in southern Jerusalem. The photographic map was created by a group of residents, activists, students from the course "art and activism", led by the sala-manca group). Our attempt and results: We had an excellent workshop with lots of enthusiasm. We did one long flight with the kite photographing the construction of the road, walking along it. The second flight was done independently by the students and activists, it was their first flight and they did a great job! Unfortunately we had a bad unmount of the memory card from the computer and the second batch of photos was deleted! But we will do another flight soon to restore the photos that were lost. Here is a link to the beginning of the stitched map: Questions and next steps: We hope to work a bit deeper with people from the community which are greatly affected by the road and create another layer of annotation, later to be used for presenting their case in court. The full map was created together with Hellen Vexler and Ala Salman, by photographing from 4 different points along the road. Road 4, a 6 lane highway, cuts through the neighborhood with devastating consequences on its residents' quality of life, everyday mobility and community life. By creating a high resolution photographic map of the road they could visualize the story of the community in their advocacy efforts. As a member of the community who participated in creating the map said, the map enabled to show the damages of the road in "realtime", "בשידור חי". Furthermore it was a way to resist the political invisibility forced upon the Beit Safafa community with the ongoing construction of the road, that never seized in spite of their protests and legal efforts. They were resisting the political invisibility by reincorporating the very same visual technologies that assist in rendering them invisible by institutional planners and decision makers. see background details here In Kiryat Hayovel a predominately jewish neighborhood in southwest Jerusalem, the community center together with students created a photographic map of an urban biosphere in a valley that crosses through the neighborhood, mapping and visualizing updated information about its natural and social values with the aim to take significant part in decision making on the future and preservation of this site. 23-24.4.2014 Mapping "Vadi Hayovel" with Ytav Bosira (urban planner), Dana Gazy (community worker), Liat Brix, Batel Yossef (architects) and students in and the civil architecture Unit in Bezalel. we managed to balloon map the valley and collaborated with the Mushon Zer-Aviv and Nir Yariv from the Open Knowledge Workshop in processing the aerial and ground photographies we produced during the day, we used github, mapbox and tilemill. This is a pilot we intend to develop further.